As a homeschool co-operative, our students come together to learn worship music, art, biology, drama and more. We hold a Science Fair and an Art Fair every year as well as a graduation for our seniors. SAGE and PAGE has been serving Hampton Roads' families for nearly two decades. 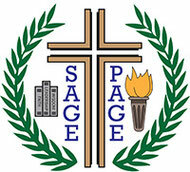 SAGE and PAGE is incorporated and is a non-profit 501-3c organization. We are a Christian co-op that upholds a traditional Christian worldview and uses the Bible as our standard of truth. Participation in our co-op mandates that the families desire their children to be mentored in this traditional Christian worldview and that the actions of each individual reflects core Biblical guidelines. Our co-op is comprised of: PAGE (Peninsula Academy of Godly Education) which meets at Deer Park Baptist Church in Newport News on Fridays and runs a full day; and SAGE (Southside Academy of Godly Education) which meets once or twice a month for field trips and special events. Our mission is to provide academic, social and spiritual enrichment to home-educated children and their families in a safe environment. We endeavor to keep our co-operative cost to members down so the fee is per family without regard to how many children, and each family contributes in some way. Our teachers are volunteers and the parents of current or past students. We believe that as a co-operative, parents should contribute their time in some way and become personally vested in making our co-operative work.